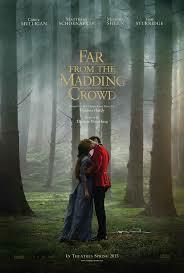 Adapted from the 1870 Thomas Hardy novel, “Far from the Madding Crowd” is the story of Bathsheba Everdene, an independent Victorian-era woman pursued by three suitors. First, there is Gabriel Oak, a farmer and shepherd. Gabriel proposes to Bathsheba early in the film. Bathsheba likes Gabriel, but does not love him, and says she is too independent to marry him. Soon afterward, Bathsheba inherits an estate owned by her uncle. She moves to take charge of the estate. Bathsheba surprises most of the workers and her neighbors when she announces that she plans to manage the estate herself. Gabriel turns up at the estate and she immediately hires him. Bathsheba also meets William Boldwood, the owner of a neighboring estate. William takes a liking to Bathsheba, and is soon asking for her hand in marriage. In the meantime, Francis Troy, a soldier, is preparing for marriage. He arrives at the church, but his fiancée does not show up. Mistakenly, she has gone to the wrong church! Thinking that his fiancée has jilted him, Francis wanders aimlessly throughout the region. He comes across Bathsheba’s farm. Bathsheba finds Francis to be dashing and handsome in his uniform, and falls for him. Screenwriter David Nicholls has done a fine job of adapting Hardy’s novel into a two-hour movie. As you can imagine, it is visually beautiful. Director Thomas Vinterberg utilizes the picturesque English countryside well. This movie is well-paced; it takes its time to tell the story, without dragging. Carey Mulligan gives a good performance as Bathsheba. She is fiercely independent and confident, which makes her seem like a contemporary heroine. However, that independence does not always serve her well in romance. Dutch actor Matthias Schoenaerts is excellent as Gabriel, strong, silent, and loyal to a fault. Michael Sheen is also good as William, who loves Bathsheba, but is concerned that his age will be a hindrance to their marriage and happiness. The weak link is Tom Sturridge as Francis, who is not as dashing as the role required. It was hard to see what Bathsheba saw that attracted her to him! “Far From the Madding Crowd” is an engrossing and beautiful movie. If you’re looking for a change of pace from the summer action movies, this may be the one for you.